The probability that one in every five black people that you will encounter is from Nigeria is very high. This observation is close to reality because Nigeria has the largest population of black people anywhere in the world. The Nigerian population is over 180 million and growing. As a result of this population growth, Nigerians constitute a large portion of foreigners living far away from their home countries. This results in the need for a reliable, convenient, and cost effective way of reaching out to friends and family back in Nigeria. Making international phone calls with traditional phone companies is known to be very expensive. This has created a vacuum which is being filled by mobile VoIP apps with cheaper options for Nigerians to call friends and family. 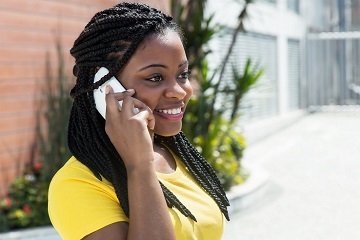 This article looks at three (3) mobile applications for making phone calls to Nigeria. These are : Google Voice, Otubio, and Whatsapp. The Otubio app is a mobile VOIP application that allows users to make international calls through the internet and/or local access numbers. As opposed to Google voice, users get to keep their existing phone numbers and are able to make calls that display their actual caller ID. Otubio has no restrictions and can be used anywhere in the world. A key advantage Otubio has is that it allows users to make international calls to Nigeria with high quality at competitive rates. Otubio offers Pay As You Go as well as monthly plans to Nigeria. Unlike whatsapp, users are able to call telephone numbers with Otubio. The recipient in Nigeria does not need to have the Otubio app to receive calls. The Google Voice app, like most international calling apps, makes use of VOIP to connect international calls. A good feature of the Google Voice app is that it allows the users to pick a number that can be synced on multiple devices. The users can make calls through the app and also send text messages via the website. For calling Nigeria, Google voice has pretty good rates although they could be cheaper. The calls are usually clear although sometimes echoing may occur. This can also be as a result of the users internet connection. While the Google Voice app is certainly cheaper than using traditional phone companies like Verizon, T-Mobile, and AT&T to call Nigeria, there are certainly other apps that offer even cheaper options. A major setback for callers to Nigeria is with regards Caller ID. Since most users already have established phone numbers, they would either have to port their existing number or use the number provided by Google Voice. As a result, the recipients in Nigeria may not initially know who is calling. Also, Google Voice is available for North American users only which means Nigerians living in several countries worldwide may not be able to use it. Like Google Voice and Otubio, Whatsapp also makes use of the internet to connect users to other recipients in Nigeria. The main difference is that with whatsapp, both the recipient and the caller have to be on the whatsapp network. While whatsapp allows people to communicate, it currently can not be used to call mobile phones or land phones in Nigeria. Calls can only be made if the recipient has whatsapp installed.